Anaheim, CA – Bluefin, the leading North American distributor of toys, collectibles, and hobby merchandise from Japan, Hong Kong and more, makes itself synonymous with Tamashii Turtle Nations as it excites fans and collectors with a pair of new S.H. Figuarts Teenage Mutant Ninja Turtle releases for the classic action property. These new Tamashii Nations figures are being made specifically for the North American market and will be available for a limited time. The first-ever S.H. Figuarts versions of Teenage Mutants, Raphael and Michelangelo, are set for release to retailers in October and will be offered in the classic colors of the original animated series. Each figure stands approximately 6 inches tall and features the full articulation S.H. Figuarts products are renowned for as well as a variety of interchangeable accessories. Raphael and Michelangelo augment the upcoming summer releases of Leonardo and Donatello. The figures will be available from authorized Bluefin retailers nationwide and also from a variety of leading online outlets. Preorders are available now. Get your cowabunga on S.H. Figuarts style (and grab some pizza while you're at it too). The “cool but rude” Raphael is the third Turtle to join the series complete with his classic weapon, a pair of sais. The sais can be stored on Rafael’s belt which also comes with interchangeable parts. The set includes interchangeable hands (x6), interchangeable head (x1), sai (x2), optional weapons (kunai, shuriken), and interchangeable belt parts. 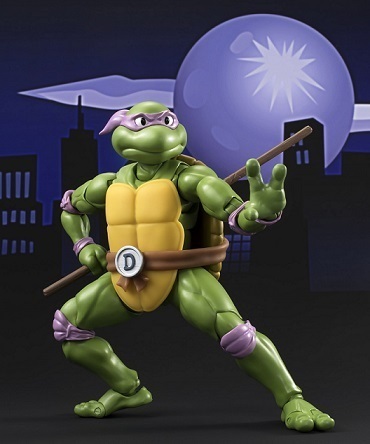 The final Turtle to join the group is “the party dude” and comic relief, Michelangelo! He appears with his classic nunchaku weapons and Turtle grappling hook that fans will instantly recognize from the show. The set also includes interchangeable hands (x6), interchangeable head (x1), nunchaku set (for posing), nunchaku set (for holding and storage), interchangeable belt parts, and a Turtle grappling hook. Collectors will not want to miss what’s in store from S.H. Figuarts! The first-ever S.H. Figuarts versions of everyone’s favorite Teenage Mutant Ninja Turtles are coming in classic animation colors! These new Tamashii Nations figures are being made specifically for the North American market and will be available for a limited time. First to join the line-up is the leader and most pragmatic of the brothers - Leonardo. Strategic use of die-cast material is integrated for realism in the belt buckle and weight in the legs. The Leonardo set includes his iconic katana (x2), interchangeable head, interchangeable hands (x6), weapon holding parts, and manhole covers (x2). Second to join the line-up is the brains and inventor of the brothers - Donatello. Strategic use of die-cast material is integrated for realism in the belt buckle and weight in the legs. The Donatello set includes his formidable staff, interchangeable head, interchangeable hands (x6), weapon holding parts, and a pizza. Based in Irvine, CA, Bluefin built its reputation as a leading distributor of Japanese toys, collectibles, novelty and hobby products. In recent years, Bluefin has grown to include a range of high quality collectible lines from the United States, Hong Kong, Taiwan and Singapore and established itself as the official North American consumer products and retail development partner for Studio Ghibli. Selling to thousands of specialty, chain and independent stores, Bluefin is an official North American distributor for Bandai Hobby, Kotobukiya and Capcom, is the sole provider of Bandai Tamashii Nations products, and is also the exclusive and official distributor for Hero Cross, Beast Kingdom, Mr. Hobby, SEN-TI-NEL and X-Plus. Bluefin also represents TruForce Collectibles products worldwide. Additional information is available at: www.bluefincorp.com.